There's certainly no shortage of choice when it comes to monitors. The LCD manufacturing process is mature enough to offer you, the consumer, a 24in, full-HD monitor for less than £100. But what if you're a gamer? What do you look out for? Ideally the checklist goes something like this: a bigger screen, QHD resolution at the least, some form of adaptive v-sync for smooth gameplay, an attractive chassis with a small bezel, competitive price and decent connectivity. You could probably guess this was an iiyama screen without the need for the company's branding; the matte finish and stand are consistent with the design aesthetic that has been in evidence for years now. This is no bad thing, mind, as the build quality is solid, if unexciting, and the stand takes but a minute to attach. The bezel, at a centimetre thick on the sides, doesn't draw your attention away from the screen. There's a reasonable level of positional adjustment on offer, from 130mm height, 27-degree tilt, and ability to pivot a full 90 degrees for portrait mode. Handily, the stand itself can be manoeuvred by 45 degrees, and, unlike some, the action is smooth and consistent. A couple of basic, 2W speakers are included that serve up simple audio fare. The rear shows the 100mm VESA mount and two cutouts for the inputs and two-port USB 3 hub, respectively. 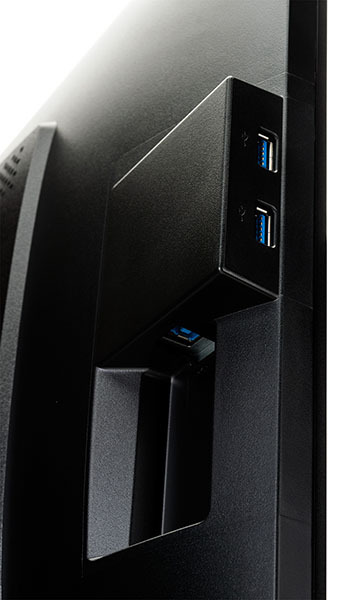 The B2783QSU houses three digital connections - HDMI, dual-link DVI, and DisplayPort 1.2, the latter needed for FreeSync compatibility. AMD has since announced FreeSync-over-HDMI but that's not a concern here. There's also a headphone jack and audio input for driving the aforementioned speakers. A built-in power supply means a standard kettle lead is all you need to fire it up. 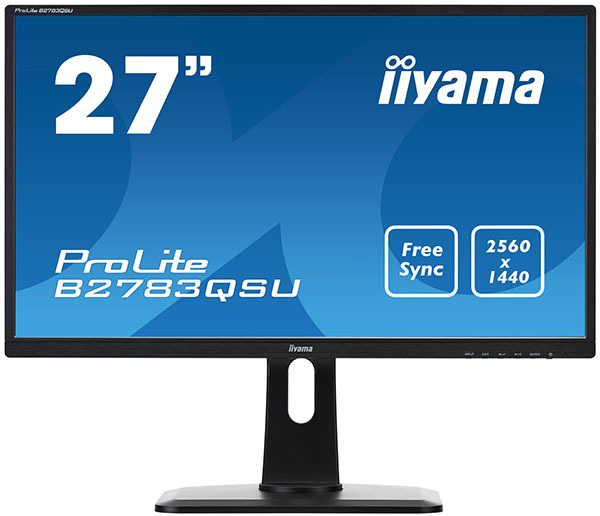 Keeping clean lines on the front means that iiyama has six control buttons on the back. These haven't progressed for a number of years and fall behind the joystick-type controls often found on, for example, Asus and recent BenQ monitors. The on-screen display (OSD) is small and seems outdated compared to the more intuitive versions available from competitors. That said, you can control the most important facets fairly quickly once you get the hang of it, though we'd wish the OSD would remain active for a few seconds longer when changing parameters. Where the company does score better is with bundling. The box contains DVI, DisplayPort, audio and USB cables. It's backed by a three-year warranty, as well. So what about the screen itself? The optimum combination is a high refresh allied to a wide supported range for FreeSync goodness. Here is where some of the monitor's budget provenance comes through. iiyama's chosen panel has a maximum refresh rate of 75Hz while FreeSync support kicks in at 48-70Hz. The lower limit is the most troubling, because you want to have the technology active at 35-40Hz commonly seen on other screens.